One of the advantages of writing a non-fiction book is that you can take the opportunity to look back over previous materials and pick up forgotten threads. ESA's Rosetta mission to Comet 67P provided a wealth of scientific data, and some fabulous images of the comet's rubber duck-shaped nucleus. One of the most curious findings to emerge from analysis of the vapours driven off the comet was the unexpected presence of molecular oxygen (1). Perhaps because we are so accustomed to the oxygen-rich composition of the Earth's atmosphere, the presence of gases exuding from Comet 67P containing 4% oxygen may not seem so weird. But it really is. Oxygen is a reactive molecule, and will go out of its way to combine with hydrogen to make a much more stable combination in water. Because there isn't much hydrogen around in the Earth's atmosphere, oxygen doesn't have anyone to play with. Besides, our planet's oxygen supply is continuously replenished by photosynthesis. No one, not even the wildest conspiracy theorists, could advocate photosynthesis going on within a comet. So, there's a problem. 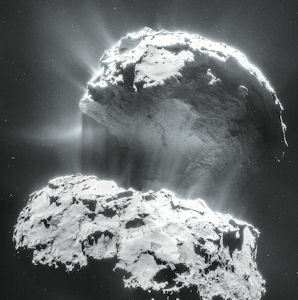 Comets are ancient bodies, left over building blocks from the very beginning of the solar system. Any oxygen held by the comet has had both time and opportunity to combine with hydrogen to make water. It simply shouldn't be available as a volatile ice, waiting for the Sun's heat to boil it off into space, as is the case with water and carbon dioxide. Many scientists rushed to bang that square peg into a round hole, but their arguments did not seem particularly convincing at the time. This is how this may be playing out on a comet: Water is driven off the comet by the usual sublimation process: The irradiating heat of the Sun causes the volatile water ices to be converted into vapour. A similar process takes place with dry ice, blasting carbon dioxide into space, and driving out the water vapour through a process known as 'outgassing'. This is, of course, what gives a comet its distinctive tail. Once in space, the irradiating power of the Sun ionises some of the water, and the solar wind drives some of it back down against the surface of the comet. Here, the ionised gas hits materials which have oxygen built into them in the form of oxides, like rust and silicates. 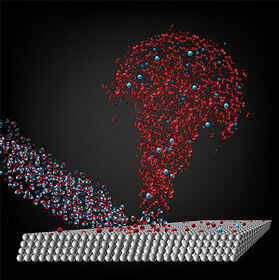 The ionised water drives some of this oxygen out, and combines with it to produce molecular oxygen. Wow. This work interests me for another reason. I'm really interested in what is happening with planets outside the Sun's heliosphere. Beyond this distant boundary in the solar system, objects are technically in interstellar space, even though they may still be orbiting around the Sun. The conditions out there are different. I think it's likely that these different conditions create the potential for new planet-forming mechanisms over long periods of time - or at least, the capacity for unusual effects around planets which would not happen within the heliosphere (4). There are two differences to consider. The first is that the driving solar wind does not extend beyond the heliopause, and the mechanisms for 'clearing' interplanetary space are not at play. The second is that objects beyond the heliosphere are exposed to diffuse interstellar materials, which are moving at high speed comparatively. These include water and ionised water (astrochemistry is assisted by highly energetic cosmic rays). This combination could provide some very interesting effects around minor and major bodies beyond the heliosphere, and particularly on and around planets. Planets, after all, have sufficient gravity to be able to hang on to their atmospheres, unlike comets. I will explain more about this in the forthcoming new Dark Star book. Meteorites that fell to Earth in 2008 contain evidence of a destroyed planet. Following the explosion in the air of the 4m wide 2008 TC3 asteroid over the Nubian desert in Sudan, meteorite hunters have since gathered together 600 meteorite fragments, totalling 10 kg of the ancient space rock. This came to collectively be known as the Almahata Sitta meteorite. Although this quantity of space rock is impressive, it is only a tiny fraction of the initial mass of the asteroidal meteor, which had weighed some 80,000kg. 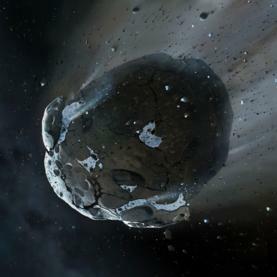 This was the first time an asteroid had been tracked and predicted to impact the Earth (1). The fireball that resulted from the mid-air explosion of this bolide was seen hundreds of miles away. The event was reminiscent of the Tunguska explosion 100 years before, although on a much smaller scale. Asteroids cut across the Earth's orbital path more often than people realise (2). Early analysis of Almahata Sitta meteorite fragments showed the inclusion of nanodiamond and graphite micrograins among the more common olivine grains (3). Some of the nanodiamond fragments were fractured segments of what had once been larger diamonds. Impurities within the diamond fragments indicated that they had grown slowly, rather than having been formed as a result of a sudden catastrophic collision. Their relative size implies the same. The most likely environment for such growth to take place is deep within the mantle of a planet. Even a sizeable asteroid may not be large enough to create these internal conditions. This begs the question: How could material like this have found its way into space, having originated deep within a planet? The early solar system offers the opportunity to place such an event within a catastrophic milieu. It is thought that there were a great many proto-planets forming, and jostling about, during the first ten million years of the solar system. Some of these went on to form larger planets; others were ejected into interstellar space; some may have been destroyed by internal disruption through the nearby gravitational influence of a gas giant, like Jupiter; more still were destroyed by collisions with either the Sun, or with each other. It is this latter possibility which may helpfully explain how diamonds from deep inside planets end up in rocky asteroids milling around in space. The question is, how big did this disrupted ancient world need to have been to have formed these precious internal grains? New analytical work has found impurities within the diamonds suggestive of a formation pressure greater than 20 GPa. This, in turn, implies the parent body was a Mars-sized or Mercury-sized planet, or similarly-sized planetary embryo (4). 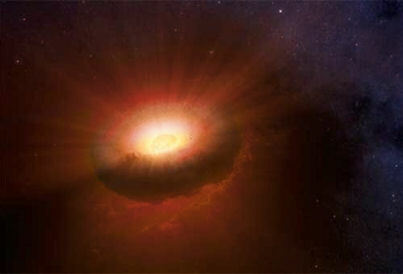 Indeed, this may be the first firm piece of evidence to suggest the prior existence of early planet-sized embryo in the early solar system (5). There are other possibilities, of course. The Moon-forming event some 4.5 billion years ago most likely involved a collision between the Earth and a Mars-sized planet (known as Theia). 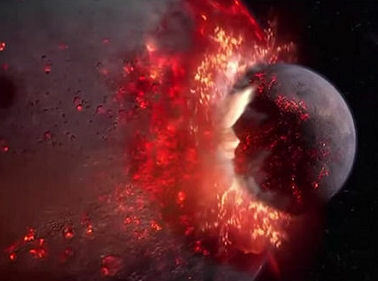 In the giant-impact hypothesis, a deep chunk of the Earth was ripped out into space, and the resultant debris cloud eventually coalesced into the Moon. The Moon and Earth share a great deal compositionally. Recently, it has been realised that the Moon contains far more water than had been thought possible, and that it had a wet start to life (6). The Moon also seems to share exactly the same isotopic composition of oxygen as the Earth; so much so, that it's hard to figure out what happened to the impactor in all of this (7). If the Moon exactly mimics the Earth in its composition, then where are the remains of Theia? The asteroids, perhaps? It seems no coincidence, in this regard, that both the Earth and Moon seem fundamentally related to asteroids found in the outer asteroid belt. In which case, might we wonder whether the near-Earth asteroid 2008 TC3 had come back to haunt us?